VALLEY, Virgin Gorda, VI- After their exploits in the Tortola Torture a week ago, road racing rivals Vincent Fournier, Julius Farley and Reuben J. 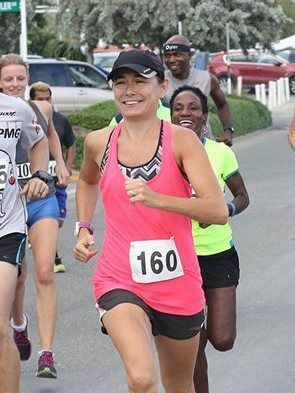 A. Stoby took the battle to each other in Virgin Gorda in the opening race of the Dive BVI 10K Series on Saturday, April 29, 2017. 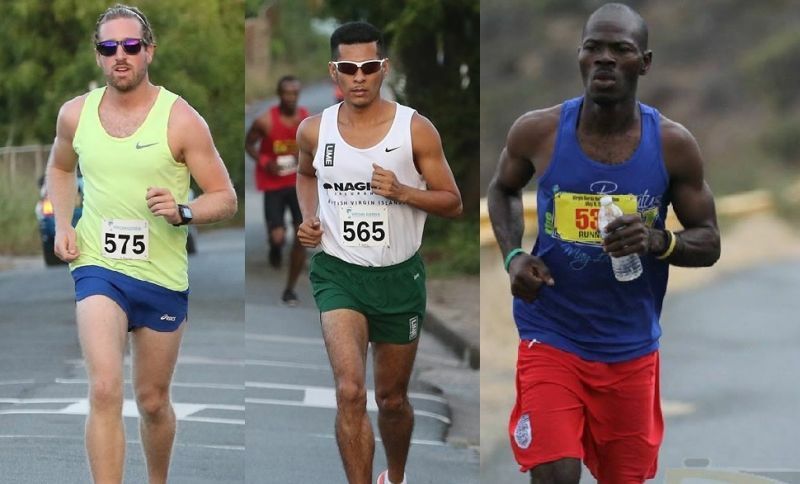 The first of two 10K races in the series takes in the first and tougher half of the Virgin Gorda Half Marathon scheduled for May 27, 2017. Famous American runner Pre Fontaine once said that “to give anything less than your best is to sacrifice the gift” and it seems the trio felt the same way as they held nothing back despite tired legs from the Tortola Torture. Fournier took the race out and led for most of the way on the climb to Nail Bay with Stoby on his shoulders and Farley a short distance off; however, on the return Farley switched gears and opened up a lead of about 80 metres on Stoby while Fournier began to fall off the pace. Stoby, however, fought back and reeled in Farley before the final mile and opened up what turned out to be an unsurpassable lead, winning in 44:46. Farley, who teamed up with Stoby and Rosmond Johnson to break the three-man team record in the Tortola Torture, was second in 46:11, while Fouriner, who was first for males in the individual race of the Tortola Torture, took third in 46:36. On the distaff side, Maria Mays had no trouble in registering victory. She clocked 55:36, while second place finisher Karen Frazer was timed in 1:00:25. Sarah Harkness was third with a time of 1:00:31. Female Road Racing Athlete for 2016 Rosmond Johnson found the going tough and had to settle for fifth in a time of 1:05:57. The second and final 10K of the series is slated for Saturday May 13, 2017. Fournier probably tired/still recovering from the Torture. ..whilst making sure she didn't beat his time! What about that keanu reeves lookalike who finished 11th though - one to watch for the half marathon I think. He bossed the beast.